> Rocket Fuel > What's Under The Hood of Programmatic? Learn The Secret To How Programmatic Buying Works! Remember back in the day when digital advertising was simple to understand? Like popping open the hood of a 1972 Ford, all the parts were simple and visible, and how they fit together was intuitive. It made sense. Now? Piecing together the modern digital advertising ecosystem is like trying to assemble a spaceship in your living room. It would be seemingly impossible to decipher how all unusual, oblong pieces fit together, much like the small armies of digital advertising players with confusing, unclear roles. The simple algorithms built to replace the slick and well-tailored "mad men" of the past are now themselves being replaced by advanced machine-learning models that make billions of decisions a day across the world. But as Rocket Fuel Director of Artificial Intelligence Michael Benisch explains in our latest whitepaper, using advanced systems to buy media programmatically doesn't have to be overwhelming. When you have the right platform, sophistication can work for you, and not against you. Having the technology to get the most out of Big Data can be the difference between serving a relevant ad to a desirable consumer, or wasting your money. 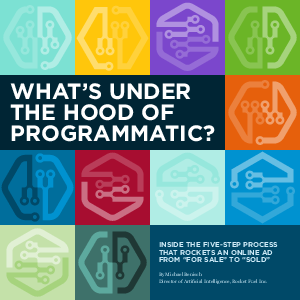 Michael will take you "under the hood" of programmatic buying and walk you through the process of how and why a consumer sees the ads they see. It all happens in a millisecond, but when he slows it down to human speed, it's easy to see how the process unfolds, and how it drives sales. How well does my programmatic partner really know consumers? Are they using fixed-price bid models to reach them? How many factors does my bidder incorporate into its model when determining a bid price? Is their bid distribution curve smooth, or is there “bid bunching” around round numbers? Pop open the hood before choosing a programmatic partner. It could be the difference between going where you want to go, or being taken for a ride. Download your copy of the whitepaper here, and below, watch Rocket Fuel CTO Mark Torrance explain how our AI-driven platform learns over time to serve consumers the most relevant and captivating ads possible.